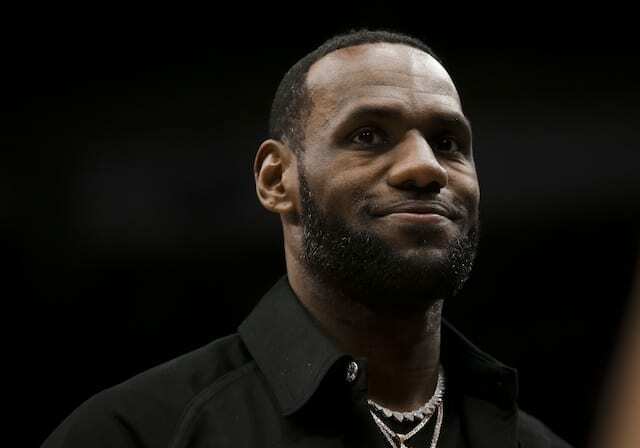 The Los Angeles Lakers head into the second game of a back-to-back set against a formidable foe: the Oklahoma City Thunder. LA spent last night battling the Kings in Sacramento, where they nearly pulled off an incredible come-from-behind victory after being down by 27 points. The rally was primarily sustained by the Lakers youth, including a career performance from D’Angelo Russell. 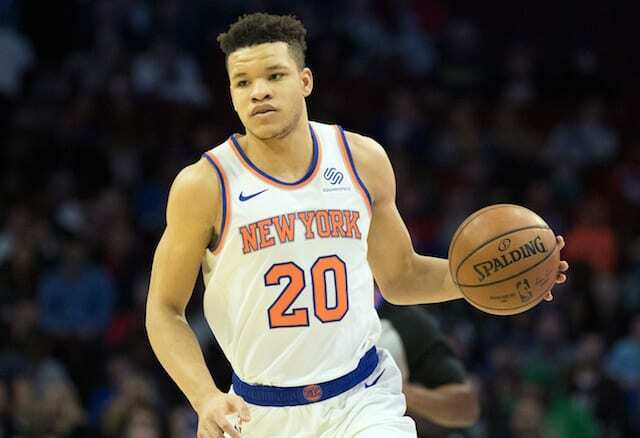 While they came up short in the end it was encouraging to see the players expected to lead the team into the future do the heavy lifting down the stretch. Now, with just a 24-hour turnaround, they will have to take on Russell Westbrook and Kevin Durant in a nationally televised game. Will the young Lakers be up to the challenge of defending their home court against the Thunder? The Lakers looked surprisingly sharp to start the game, scoring quickly off a Larry Nance jumper and five free throws from Lou Williams (he drew yet another foul while shooting a three). The Thunder were still able to exploit the LA defense for easy looks, particularly inside the paint, but LA hung tough. Halfway through the quarter the Lakers were down only 4, 19-15. D’Angelo Russell came into the game and immediately found Jordan Clarkson on a nice cut to the basket, who got to the line. Kobe followed that up with an impressive pass of his own, throwing the ball through the legs of Kevin Durant to get Roy Hibbert an open jumper. Durant and Westbrook still flexed their muscle to lead the Thunder, scoring 8 and 9 points, respectively. A banked-in three from Clarkson from halfcourt at the buzzer brought the Lakers to within 4, 32-28. D’Angelo Russell looked a bit hobbled on his sprained ankle and was subbed out just two minutes into the quarter. Within a few minutes the Lakers decided that he would be done for the night, with Marcelo Huertas taking over off the bench. Julius Randle struggled once again with his outside shot, but did a solid job on the glass. The Lakers made a push thanks to back-to-back threes from Kobe and driving baskets from Huertas and Lou Williams, forcing OKC to call timeout. The Lakers kept pouring it on after the timeout, taking the lead at the 6-minute mark on a fade-away by Bryant. The Thunder came back quickly to retake the lead, but the Lakers appeared determined to stick around. By the end of the half the Thunder had the lead 60-53, but every time they looked poised to pull away the Lakers made plays to keep themselves in the game. 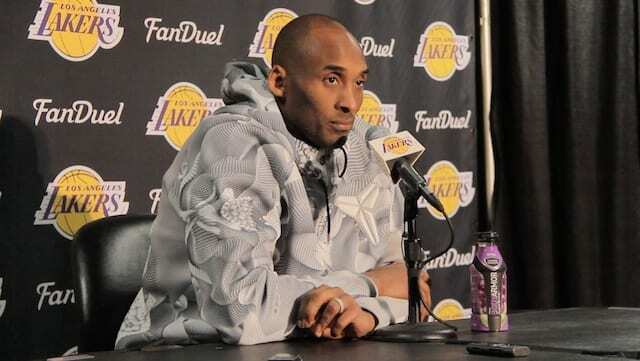 The Lakers started off the second half by forcing two Thunder turnovers, one of which resulted in a Kobe three. Williams and Clarkson both scored on floaters in the paint, but OKC’s offense started to find their rhythm. Westbrook and Durant continued to show why they are MVP-candidates, but the Lakers still had a bounce in their step. A driving basket and a pair of assist by Kobe brought LA to within 1, and the Staples Center started coming to life. Every time it looked like the Thunder were about to pull away the Lakers would make a big play or two and keep it close, even taking the lead briefly, 72-71. LA was playing with heart and hustle, which was especially impressive considering the fact that they were on the second night of a back to back. Durant scored 6 points in the final 2 minutes to give OKC a 90-85 lead at the end of the 3rd. OKC started the 4th on a 6-0 run to push their lead to 11, finally getting some separation from the outgunned-but-determined Lakers. Randle continued to struggle, his frustration painfully evident in his body language. Lou Williams continued his hot scoring to keep the Lakers in it, pulling the Lakers to within 1 with just over 6 minutes remaining. A tip-in by Randle gave the Lakers a 1-point lead, and then Westbrook and Lou traded threes as the Staples Center crowd rose to their feet. Lou would then beat Payne for a layup to give the Lakers a three-point lead. The Thunder would respond with a Durant basket and Westbrook free throws to reclaim the lead, but three free throws from Lou put the Lakers back ahead by two with three minutes left as he increased his career high to 41. Williams would draw another foul on a three and hit the free throws, but Westbrook again matched him with a three-point play of his own as the game was tied with under two minutes left. Westbrook would hit Adams for a dunk to give the Thunder a two point lead and Williams would miss a three for the Lakers. Adams would hit a pair of free throws to put OKC up four with 49 seconds left. Kobe missed a jumper, but OKC turned it over giving the Lakers another chance and Clarkson hit a three to cut the lead to one. Westbrook split a pair of free throws, but Kobe missed a tough shot to tie the game. 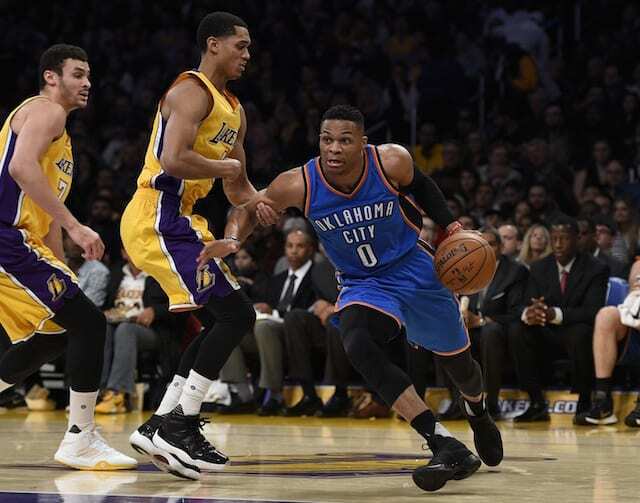 Westbrook sunk a pair of free throws to ice the game as the Thunder narrowly beat the Lakers 117-113.